A composite image of the Earth at night made using data from the Visible Infrared Imaging Radiometer Suite (VIIRS) instrument aboard the Suomi NPP spacecraft. NASA photo. Billions of people around the world routinely experience light pollution in the form of skyglow, the ever-present “haze” of light over cities at night. It comes from light on the ground scattering in the atmosphere and back to our eyes, blotting out the stars. But some of that light manages to travel all the way through the atmosphere and escape to space. Earth-orbiting satellites intercept some of that light, and their cameras provide valuable evidence of not only where artificial light at night is used in the world, but how its changing. A variety of sources available on the web help dark skies enthusiasts around the world to access images from these satellites, and to better understand the light in their own local environments. The illustration below shows how some of the light we emit on the ground ends up in the lenses of cameras aboard satellites. The streetlight emits light in many different directions. Some of the light rays (“1″) are directed up into the sky and travel completely through Earth’s atmosphere. Of these rays, a few (“2″) will be detected by satellites as they pass over the nighttime side of our planet. In still other cases (“3”), rays are scattered back to the ground by dust particles or molecules in the atmosphere, forming the familiar “skyglow” seen over cities. Occasionally, rays directed downward (“4”) reflect off the ground into the sky, where they might escape the atmosphere and be seen by satellites. Lastly, some downward-scattered rays (“5”) make it into astronomers’ telescopes, effectively blocking their view of the universe. 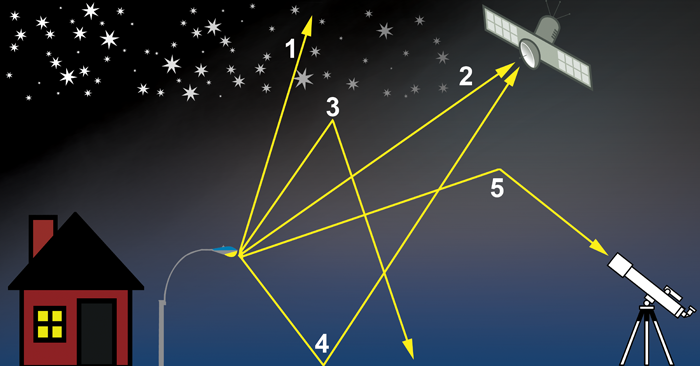 The amount of light detected by satellites is a good, basic estimate of the total amount of light emitted or scattered upward from the ground. If we make some assumptions about how much light comes back down to Earth as the result of reflection or scattering in the atmosphere, then we can work backward to figure out how much light must have left the ground. With this information, researchers can glean a lot of interesting information about humans’ use of light in particular, and about patterns of their global behavior in general. Some of the earliest artificial satellites, launched in the 1960s to monitor weather, could see the nighttime lights of Earth, but their cameras weren’t powerful enough to make scientifically useful measurements. Around the same time, the U.S. Department of Defense began its Defense Meteorological Satellite Program to gather weather information in support of American military priorities. During part of each orbit that a DMSP satellite makes, it’s in the shadow of Earth on the night side of our planet, where its cameras see not only clouds and continents, but also the lights of our cities. In December 1972, the DMSP was declassified and its data were made available to the civil scientific community. Light pollution researchers immediately realized the value of this new data source. Models of how light travels through Earth’s atmosphere predict the fractions of that light will escape into space or scatter back to the ground, and DMSP images could be used as a crucial check of those predictions. At first, these checks were performed on individual DMSP images, which only showed a small part of the Earth at a time. In 2001, a ‘World Atlas’ of artificial light at night was published, made from individual images taken on cloud-free nights without moonlight. Through careful calibration of the data and a model of how light is transmitted through the Earth’s atmosphere, the World Atlas yielded the first global measurements of the amount of human-caused light. However, because the purpose of the DMSP was to forecast weather, the cameras aboard DMSP satellites didn’t have the ability to see fine details on the ground. Many cities were seen simply as bright patches of light, without great detail. More recently, in 2011 the U.S. National Oceanic and Atmospheric Administration (NOAA) launched the Suomi National Polar-orbiting Partnership, or Suomi NPP, satellite. Suomi NPP carried to orbit a camera called the Visible Infrared Imaging Radiometer Suite (VIIRS). This camera is equipped with some the best sensors and lenses ever flown on civilian space missions, and has transformed how we see Earth at night. Whereas the nighttime images from the DMSP satellites could see objects as small as about 3 kilometers in size, VIIRS can see objects smaller than 1 kilometer. As a result, we can see fine details such as highways and ring roads around cities. You can read more about the technical capabilities of DMSP and VIIRS here. The virtual flood of data produced by the DMSP satellites and Suomi NPP is now available to the public. Here are are some websites where you can see the images for yourself. This site takes both DMSP and VIIRS images and overlays them on an interactive Google Maps that allows users to pan around Earth, and zoom in and out on particular areas of interest. A map for each year from 2008 to 2015 is available, with the exception of 2011. Comparison of different years shows how the amount of light at any particular place on Earth is changing. The figure below, showing the eastern Mediterranean Sea region (top row) and a zoom on the area southwest of London, UK (bottom row), illustrates how the resolution of the images improved significantly after VIIRS data became available in 2012. Note that even though the 2012 and 2015 maps are from the same source, they look very different. Images from 2012 are presented in a way that emphasizes faint light in rural areas at the expense of the city cores, which are bright and featureless. 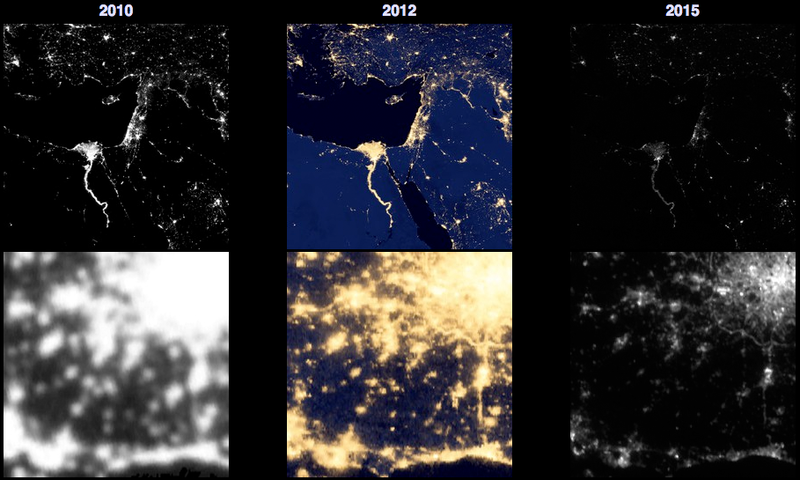 Images from the 2013-15 maps, in comparison, are scaled in a way that accurately reflects the large differences in brightness within cities, but can make rural areas appear especially dark. 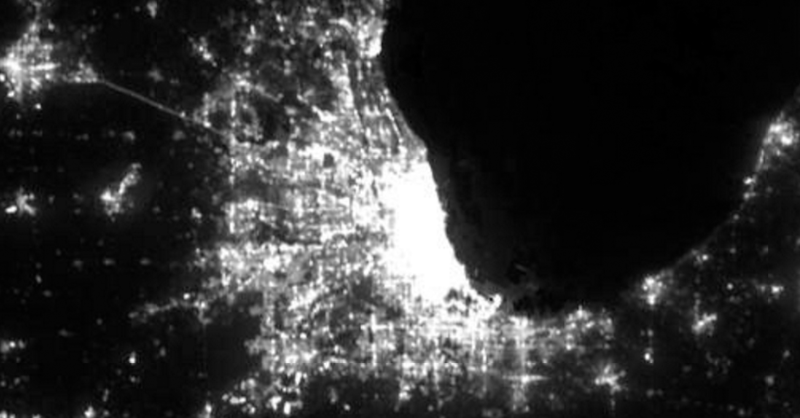 In the image below, spanning about 250 kilometers and centered on the U.S. city of Chicago, shows the nighttime light from the Chicago metropolitan area resolved into individual cities and suburbs. Interested readers can get the latest VIIRS data directly through NOAA’s website. Both daily and monthly average images are available. Be aware, however, that these are very large files! Jurij Stare, of Slovenia, created a website like the Blue Marble, but with an added feature: the light maps are calibrated in real units, allowing users to make simple (but quantitative) comparisons of the amount of upward-directed light in different parts of the world. 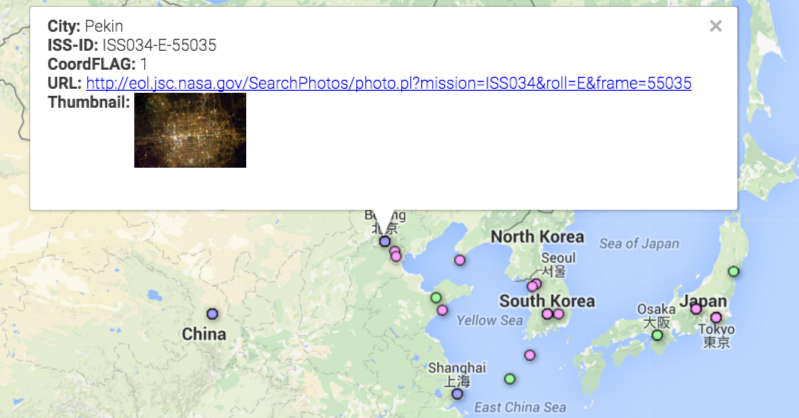 His website overlays DMSP and VIIRS images on top of an interactive Bing Map. The example below shows northwestern Europe, which contains some of the most light-polluted territories in the world, along with a scale (right) that shows the meaning of the colors on a scale of physical units. The color scale on this map is especially useful in assessing the amount of light projected from cities into rural areas. The real power of the Blue Marble and Lightpollution.info maps is in the ability to look at regions of the Earth over time to see whether the amount of light leaving the ground is changing for better — or worse. This image compares VIIRS images of the Niger River delta in southern Nigeria in 2012 (left) and 2015 (right). The dramatic increase in light between these two years is due to increased extraction of petroleum in this region, now in excess of 2 million barrels of oil per day. First published in 2001, this interactive map of the world presents the satellite data a little differently than other sites. Instead of choosing the colors to indicate the total amount of light received by sensors on the satellite, the World Atlas uses colors to show how much light measured at the ground is attributable to artificial sources scattered back down by the Earth’s atmosphere. Based on the actual light measured at the satellite and a model for how light scatters through air, researchers can predict how much of the light that is directed into the sky ends up back on the ground. This gives an indication of how much “skyglow” there is, shrouding our view of the stars in the night sky. The number of colors is greater, allowing for finer distinction among the levels of artificial light. For example, the outer gray contours above indicate artificial sky brightness levels only 5% above the natural background, indicating extremely dark skies. The extent of the gray regions shows that light from cities reaches much further into rural areas than researchers previously believed. This kind of representation of the satellite data also makes it easier to distinguish sites with truly “pristine” night skies, essentially unspoiled by light pollution. A major new update of the World Atlas was published in June 2016, incorporating the latest analysis of data from VIIRS. Note that Google Earth users can download a KMZ overlay for projecting the World Atlas maps onto the globe. Lastly, there is an addition source of images of the Earth’s nighttime lights: astronauts aboard the International Space Station. Using digital SLR cameras and an Earth-tracking mount, astronauts have amassed thousands of such images. 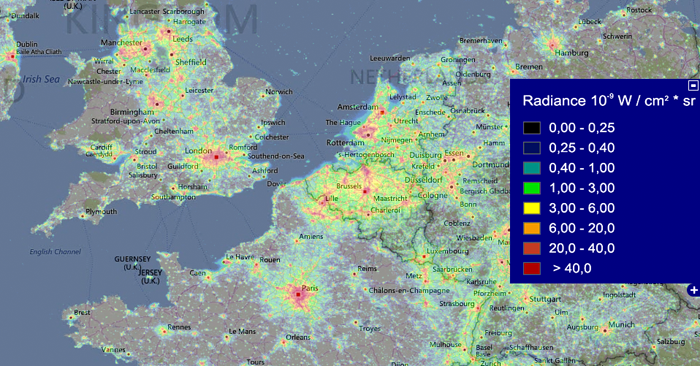 The Cities At Night project aims to crowdsource the identification of cities in the images. The targets of many of the astronauts’ images are unknown, because position information recorded for the Space Station only refers to the point on the Earth exactly below its flight path, while astronauts’ images are most often taken in directions looking away from the path. Cities At Night relies on users’ familiarity with their own cities to recognize the patterns of roads and other lit structures appearing in the images. Identified images are presented on a Google Maps base with markers pointing at the original images. 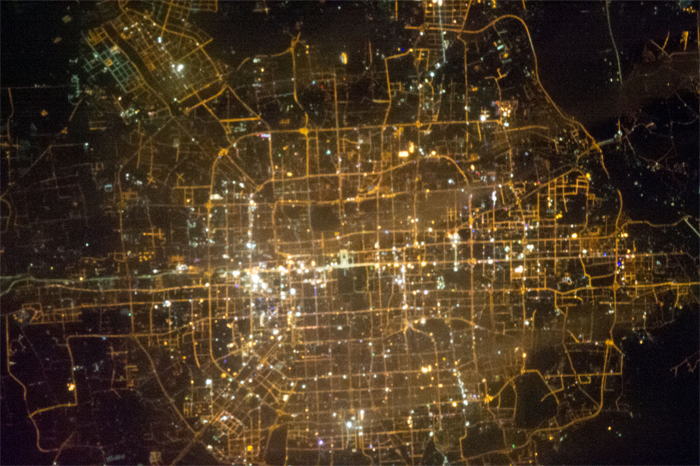 The example below shows an identified image of Beijing, China. Because of the low orbit of the Space Station — averaging about 410 kilometers above the Earth’s surface — astronaut images of cities have the highest resolution of all. They show roads, airports, even individual lit buildings. They also tell us how the colors of cities at night are changing. These two images are of the Italian city of Milan, taken from aboard the International Space Station in 2012 (left) and 2015 (right). The city center became noticeably more blue in the interim after the Milan converted much of its municipally-owned lighting from low-pressure sodium vapor lamps to white LED lamps. Other instruments, like VIIRS, are also sensing these changes. Note, however, that VIIRS isn’t especially sensitive to the extra blue light emitted by new white LED street lighting systems, so cities that have made the switch to LED (such as Milan) appear to have become darker in recent years, although they probably did not. What other interesting piece of information about our planet (and its inhabitants) lie waiting to be discovered in images of Earth at night from orbit? Have a look for yourself! Next post: Happy Centennial to the National Park Service!